Frank Frazetta probably needs no introduction. The images that come to my mind straightaway are the almost perfect anatomy drawings of warriors and women. This art book is one of the three books on Frank Frazetta, the other two being Legacy: Selected Paintings and Drawings by Frank Frazetta and Testament: The Life and Art of Frank Frazetta. This book features a biography looking at the illustrations Frank Frazetta had created throughout his career. It is really humbling to read how he rose from a kid drawing strange title like "The Elephant who wouldn't help" to the famous series of Conan. There are lots of interesting things to find out like his working relationships with editors, his choice of keeping all his prints or how he learned anatomy in a day. The illustrations included are comics from his childhood, movie posters, book covers and paintings. Towards the end, the paintings are given larger print space each with the story behind the creation. 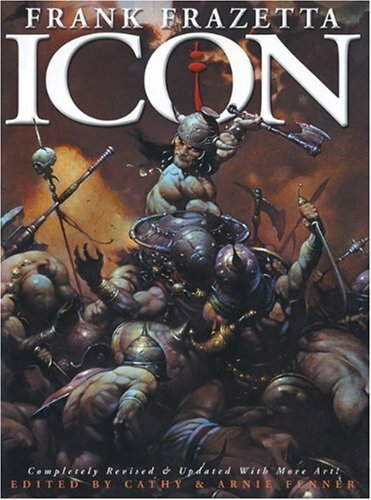 Fans of Frank Frazetta should probably save a space on your shelf for this book.